A couple of things to share today, and though it may seem like a stretch, they actually are related. Favorite thing #1. More than thirty years after first seeing it, I re-watched Michelangelo Antonioni’s Blow-Up (1966), starring the late David Hemmings. I first saw this film as a child during a weekend visit at my dad’s house. Dad had that wonderful new invention called “Cable TV” and through its magic I was introduced to all sorts of interesting movies, current and classic. Unfortunately I didn’t catch Blow-Up from the very beginning, but I managed to tune in at a critical moment — Hemmings’ character, an arrogant and affected photographer (parodied delightfully in Austin Powers years later) wanders London with his camera and ends up taking photos of a couple embracing in a park. The woman approaches him, agitated, and asks for the film back. But when she comes to his flat later, he gives her the wrong film. He then develops the actual roll from the shoot, and through a series of blow-ups, discovers that something sinister may have happened at the park. As a kid (who really wasn’t old enough for the film anyway) I wanted the story to be about the mystery, and I desperately wanted that mystery to be solved. 30+ years later I appreciate the film for its ambiguity. Favorite thing #2, in which we come to the related topic (yes, really!) 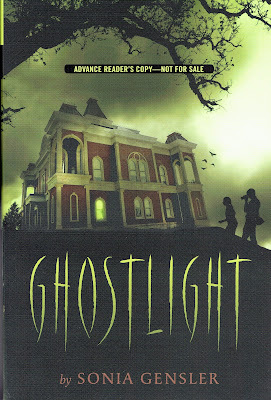 of Ghostlight and the fact that ARCs are out in the world! Now to the connection . . . we have a film for adults (considered nearly pornographic in its day — take it from me, those scenes are the least compelling element) and a book for middle grade readers (& up). What could these two things possibly have in common? Well, somewhat like in Blow-Up, the mystery in Ghostlight starts with a photograph. This photograph features something it logically shouldn’t, which leads to a project, a betrayal, and, ultimately, an investigation. Though this “clue in a photograph” idea is not particularly unique, I know the seed for it was planted in my brain all those years ago when I watched Blow-Up and really wanted that mystery to be solved. Also, strangely enough, I think one of the characters in Ghostlight was probably, subconsciously, inspired by the main character in Blow-Up. Julian Wayne isn’t quite as reprehensible as Thomas (though he was darker in earlier incarnations of the story). He is similar, however, in that he’s arrogant and obsessive and grows pretty impatient with people who don’t appreciate his passion for filmmaking. And look here — we have official flap copy! 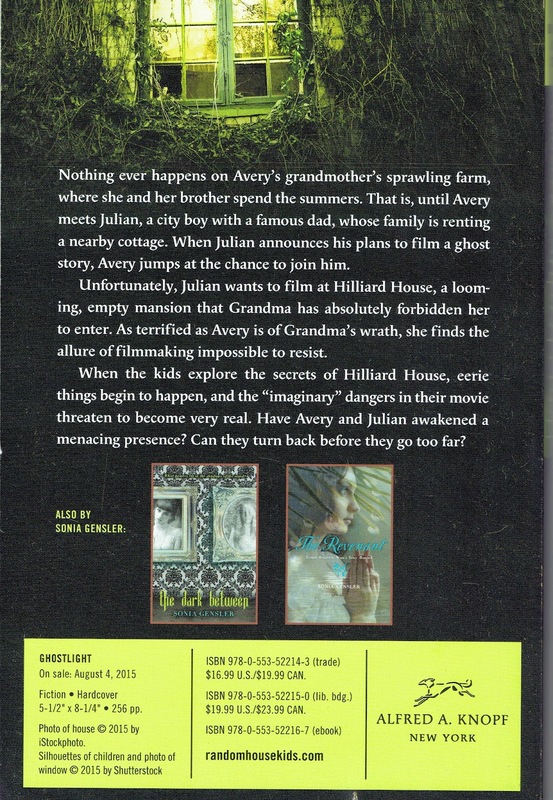 Nothing ever happens on Avery’s grandmother’s sprawling farm, where she and her brother spend the summers. That is, until Avery meets Julian, a city boy with a famous dad, whose family is renting a nearby cottage. When Julian announces his plan to film a ghost story, Avery jumps at the chance to join him. Unfortunately, Julian wants to film at Hilliard House, a looming, empty mansion that Grandma has absolutely forbidden her to enter. As terrified as Avery is of Grandma’s wrath, she finds the allure of filmmaking impossible to resist. When the kids explore the secrets of Hilliard House, eerie things being to happen, and the “imaginary” dangers in their movie threaten to become very real. Have Avery and Julian awakened a menacing presence? Can they turn back before they go too far? So there you have it! I no longer have to ramble nonsensically about the premise of this book, for that sums it up pretty nicely. Perhaps I’ll give one of these ARCs away before too long? Stay tuned! And HAPPY FRIDAY!!! This entry was posted in Watching, Writing and tagged books, friday favorites, Ghostlight, movies, writing on January 9, 2015 by SoniaG. 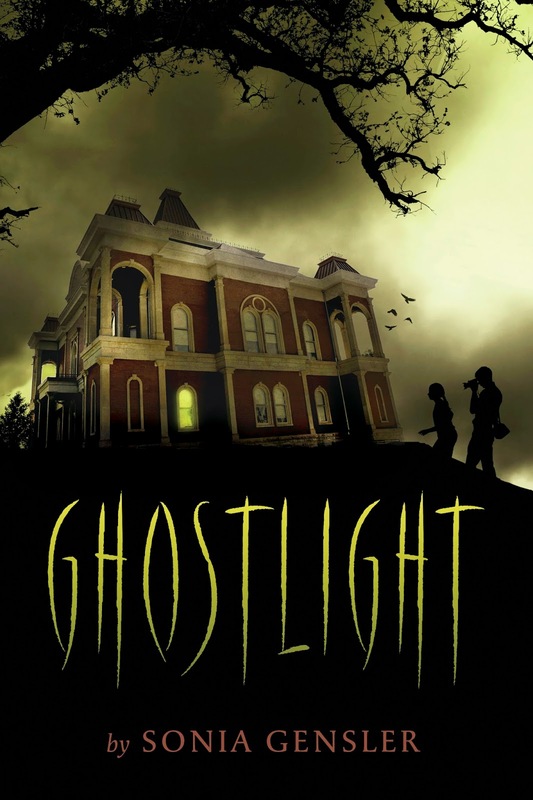 GHOSTLIGHT release date, pre-order details, and COVER! Super 8 meets The Haunting. 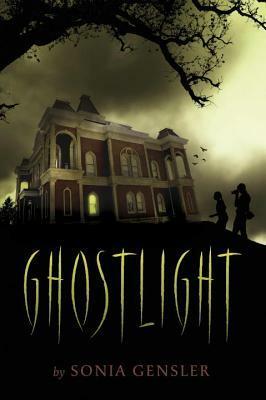 If that doesn’t resonate for you (as it wouldn’t for most 12-year-olds), I would say that it’s a story of three kids who are making a ghost movie in a derelict mansion — a sad shell of a home that’s harbored dark secrets for decades. Hijinks and spookiness ensue! Did you know that pre-orders are LOVE? Lisa Schroeder explains it here. I’m so excited about this book and can’t wait to share it with you! This entry was posted in Writing and tagged Ghostlight on December 15, 2014 by SoniaG.